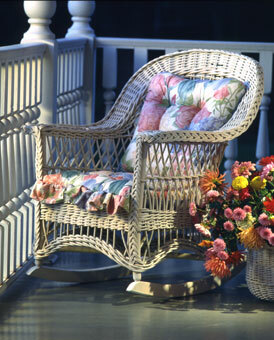 Wicker chair with basket of flowers occupies the corner of my porch in Wethersfield. I seldom sit in the chair, but love its welcoming appearance on the porch. I put it there for the mailman and the morning paperboy, for they are about the only ones who ever use the porch. Everyone else who comes to see us drives down the driveway to the back door. We are almost all backdoor people here on Broad Street.